Round One was dominated by the road teams and defensive coordinators. Three middling games and a high drama finale to cap the weekend. Three neophyte quarterbacks gained experience but none of them advanced and their youth worked against them. Although there are eleven men on the field for each side, at the end of the day losing fans and media will aim their vitriol towards one target: A QB, a coach or a lonesome kicker. The Texans hosted in their familiar curtain jerker spot and had no answers for Andrew Luck and T.Y. Hilton early. Matt Eberflus’ defense frustrated DeShaun Watson all day and the Colts defensive coordinator now has to prepare for Pat Mahomes and potential head coach interviews. Dallas was the only team to hold serve at home thanks to huge 3rd down plays by their franchise players. Down 6-3 with one minute left in a lackluster first half Ezekiel Elliot trucked 44 yds on a 3rd and one for his longest journey of the year and the Cowboys followed with their first TD. Forward to the 4th quarter, up 17-14, Dak Prescott on 3rd and 14 made a Herculean 16 yd scamper to bury Seattle. We were robbed of a fascinating moment if the Cowboys had to settle for a FG. At 20-14, if Seattle scored the tying TD they would have had to finish with a two point effort as their punter Michael Dickson was incapable of place kicking after Sebastian Janikowski went down. The Chargers defense took over on Sunday in Baltimore from the first snap. Anthony Lynn and Gus Bradley dialed up a speedy, seven defensive back formation that totally flustered Lamar Jackson. Melvin Ingram destroyed the Ravens offensive line up front turning the home crowd against Coach John Harbaugh and Jackson. The Ravens line pushed the Chargers around two weeks earlier but had no answers this time for the Chargers speed and it’s doubtful Joe Flacco would have made a difference. 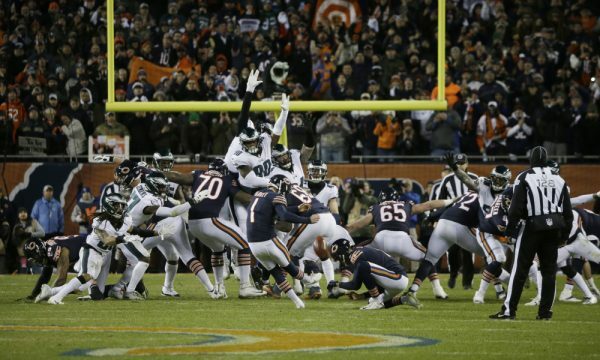 The high drama of the weekend was all saved for the 4th quarter in Chicago. The Bears let the Eagles hang around and cool, calm Nick Foles came through again. Bears fans want to torch Cody Parkey but their vaunted defense only had one sack and did not create any pressure on the final TD drive and their offense settled for first half field goals. Colts at Chiefs: The Chiefs poor recent history at home along with their defensive struggles will be talked about all week leading up. The hunch is Patrick Mahomes will be up to the task and the defense will force a bad Luck turnover or two, 34-29 Chiefs. Cowboys at Rams: There might be more Cowboys fans in L.A. nullifying any home advantage and Ezekiel Elliot is on another level. The Rams might have peaked too early and the Hot Boyz will contain them, 27-23 Cowboys move on. Chargers at Patriots: The Chargers and Phillip Rivers played a perfect road game in Baltimore that will be tough to duplicate. Josh McDaniels comes up with a solid plan to neutralize the Chargers defense, 29-26 Patriots. Eagles at Saints: The only rematch from the regular season and one that the Eagles buried. They are a completely different team than the one that got routed in November. If it’s close in the 4th quarter, Foles and the Eagles are dangerous but the Saints are up to the task, 29-20.